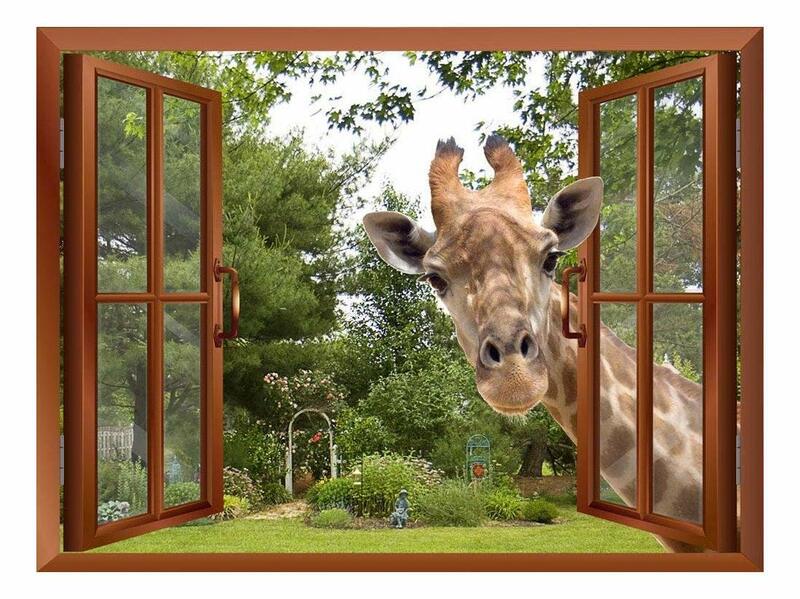 wall26 A Curious Giraffe Sticking its Head into an Open Window Removable Wall Sticker/Wall Mural - 36"x48"
Why would you not one somewhere in your home, like your bathroom? Looks just like the picture. My classroom doesn't have windows and is pretty small so I wanted to put these up to liven the place up. They actually look more realistic than I expected. They are tedious to put up (if you want to get the air bubbles out) and I really don't know how well they'll hold up if I want to move them. When applying one, it easily stretched when I was pulling it up to get an air bubble out. This stretching cause it to not lay flat without creases. Luckily it was at the very end so the rest looks fantastic. Stunning with strong adhesive for wallpapered office! I love this!! I have no windows in my new office and this life-like window helps calm my need to go crazy. I do yell at the squirls from time to time but that is just an indicator that I need to take my meds (caffeine) to continue the day. I will buy more of these in the future when I move. Worth every penny. I was doubtful, but it is every so slightly 3 dimensional. Make sure to stick it with another person so it goes on straight. Once it's on the wall, I would not re-apply since it may lose its adhesive. It has been on my office wall for a couple weeks and has held on tight. This whimsical addition to my guest bathroom is enjoyed by all. I didn't think it was all that difficult to attach. Absolutely love this mural from wall26! Love it, makes you feel like you are right next to a beach.